At this time I am no longer accepting new commission clients. I will update again about this near the end of 2018, and some spots may open up by then. It’s just too early to tell. 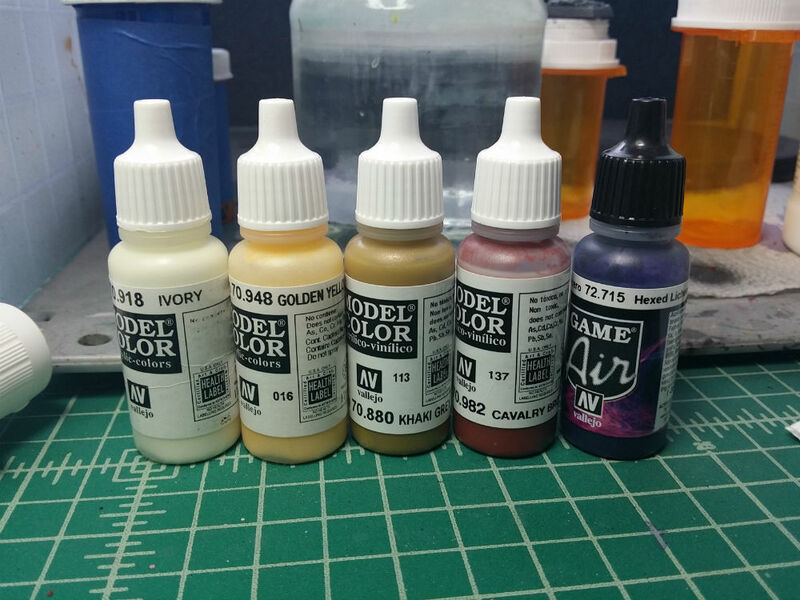 Well…it’s become obvious to me that I’d much rather spend my time painting than updating a website, so expect some changes to this site in the coming months! Good changes…I promise. I am, as always, accepting new commission clients. Currently, I am booking single models April onward, and larger projects June onward. 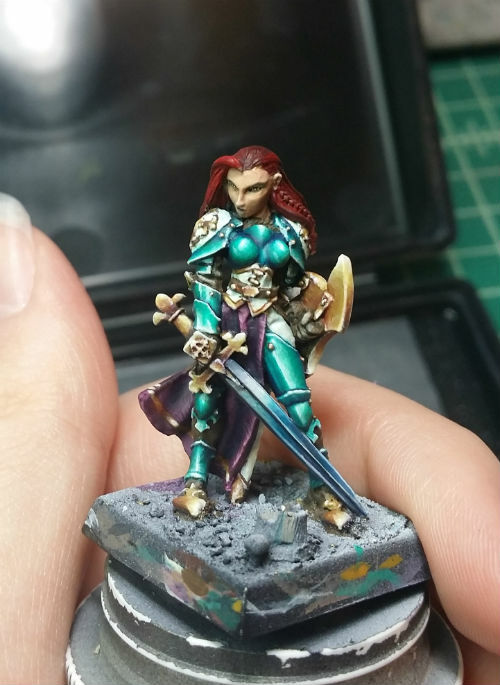 More WIP pictures! I brought back some of the metal highlights, highlighted paint chips, and worked on the visor. 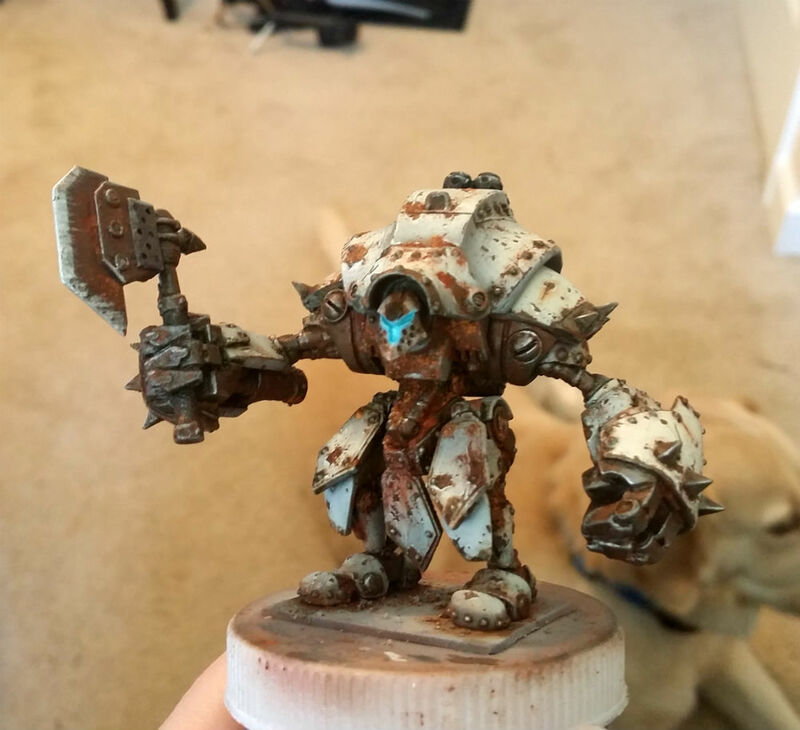 I did some work with my Secret Weapon weathering powders. 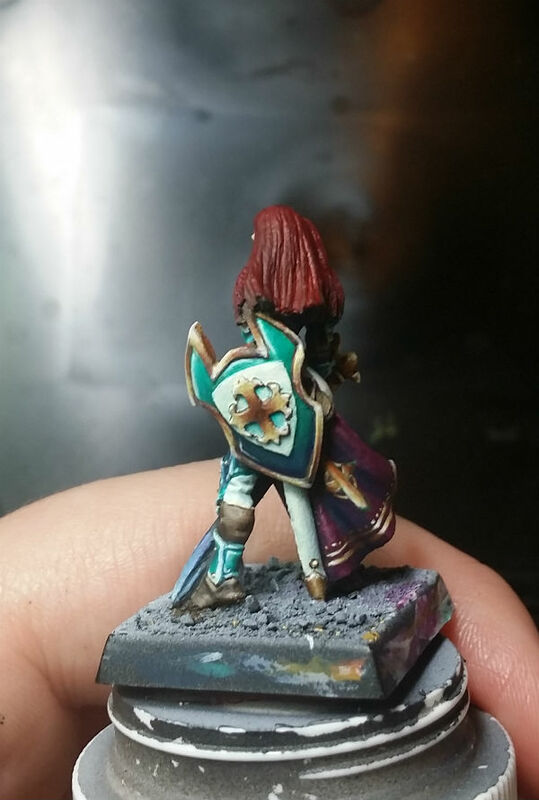 I think they’re awesome, but I can tell I have a lot to learn! 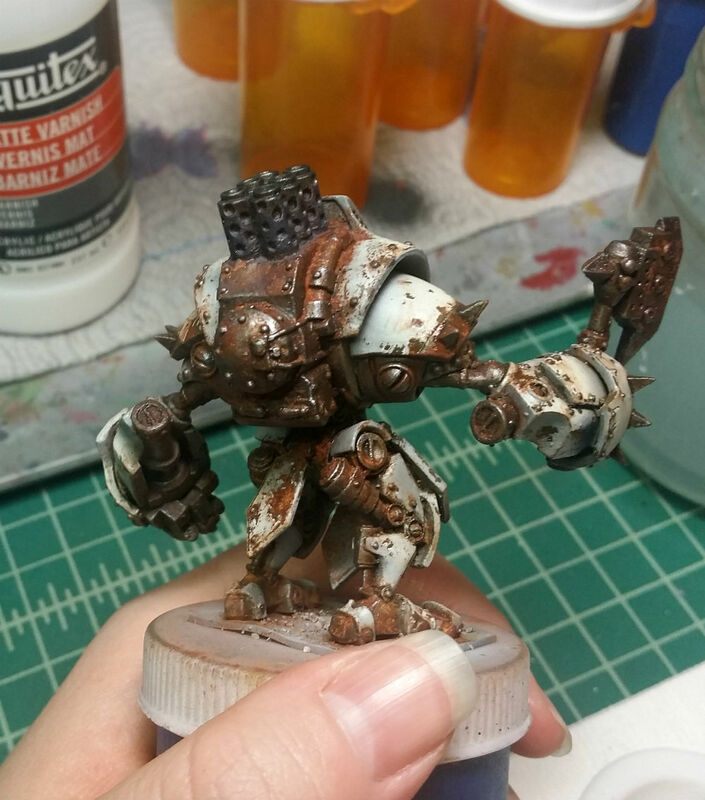 Here is another WIP of the Khador Juggernaut. 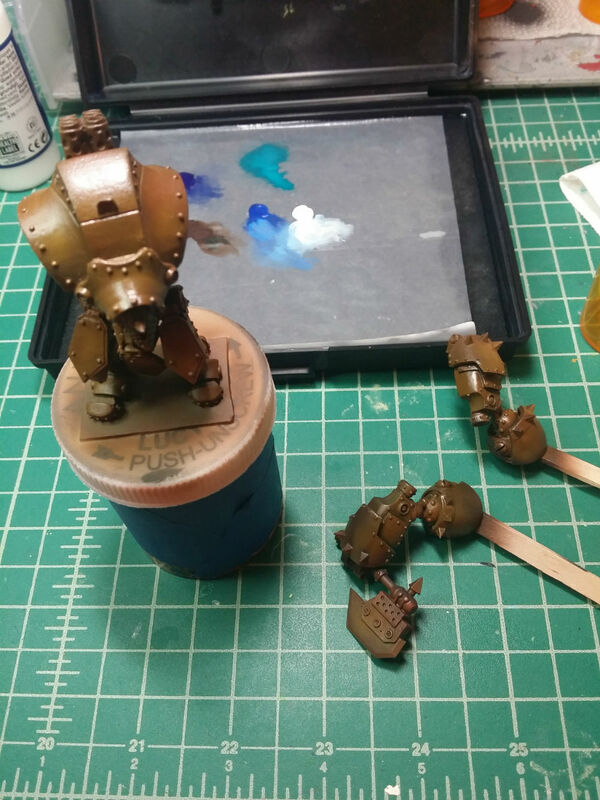 At this point I have done salt and hairspray chipping, an oil wash, and some Secret Weapon weathering pigments (so far only on the arms, and not finished). 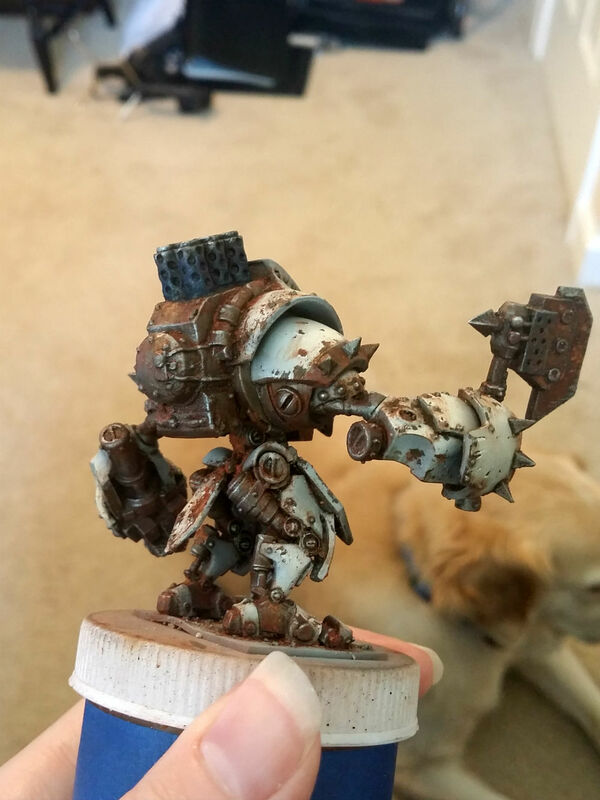 I’ve learned a lot so far about weathering painting this model. 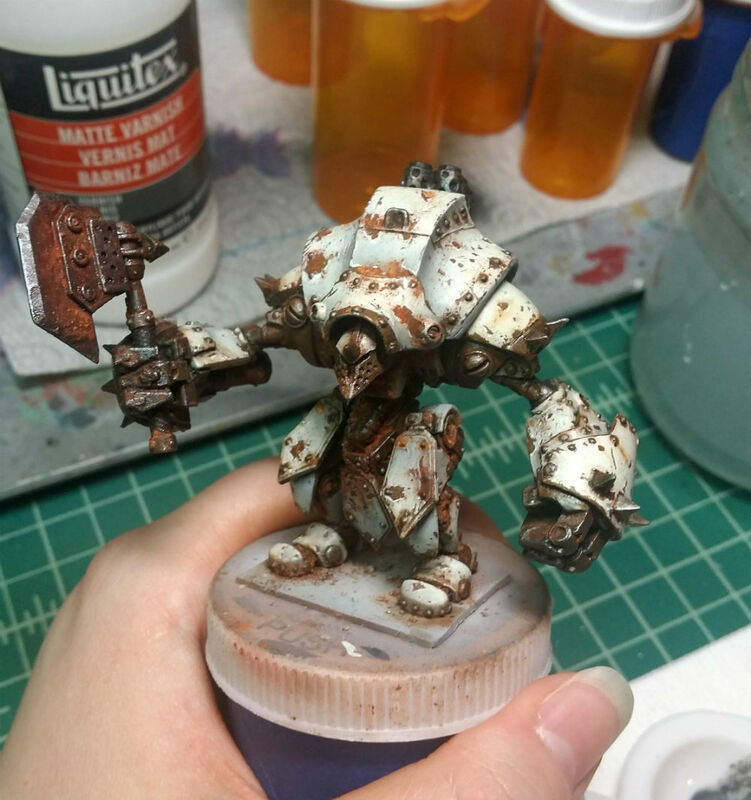 It is the first one I’ve done this much weathering on. As usual I’m working on several projects at a time. 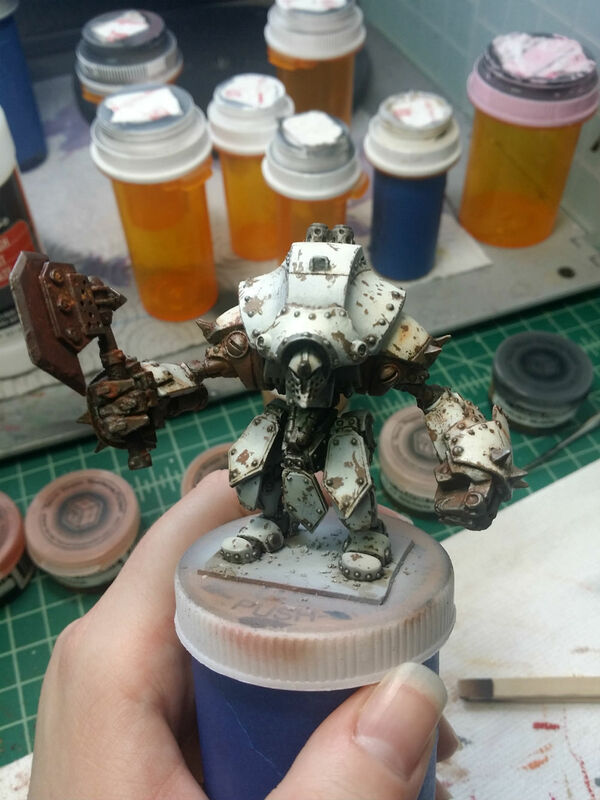 I’m adding a Khador Juggernaut to my WIP pile. Here’s a shot after putting on some modulating rust colors. Some of this will show through when I do some chipping later on. 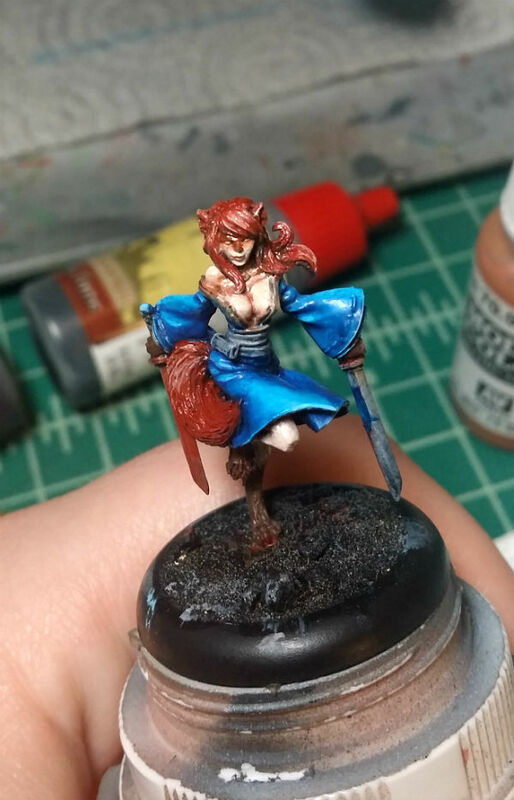 Here are more WIP shots of the Bushido Kitsune. For some reason my paint is super shiny right now, although I’ve done nothing different than normal except use my new wet palette. 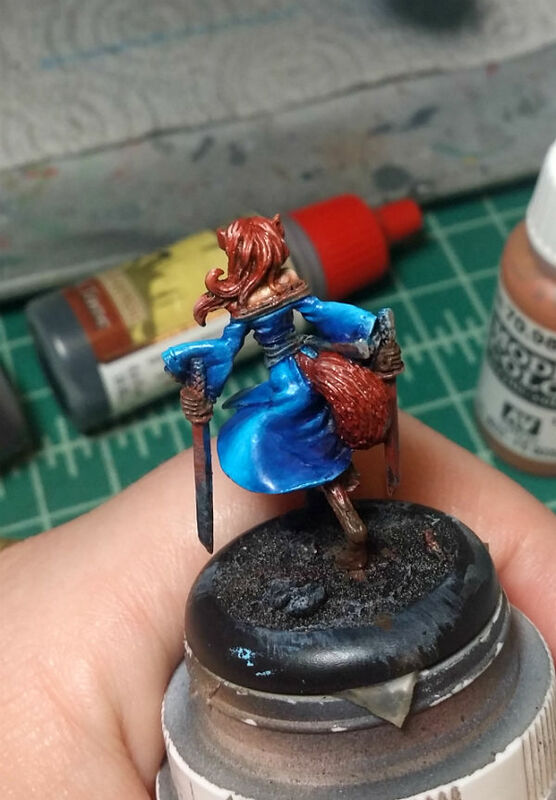 Hmm… So far I’ve mostly been focusing on her dress. 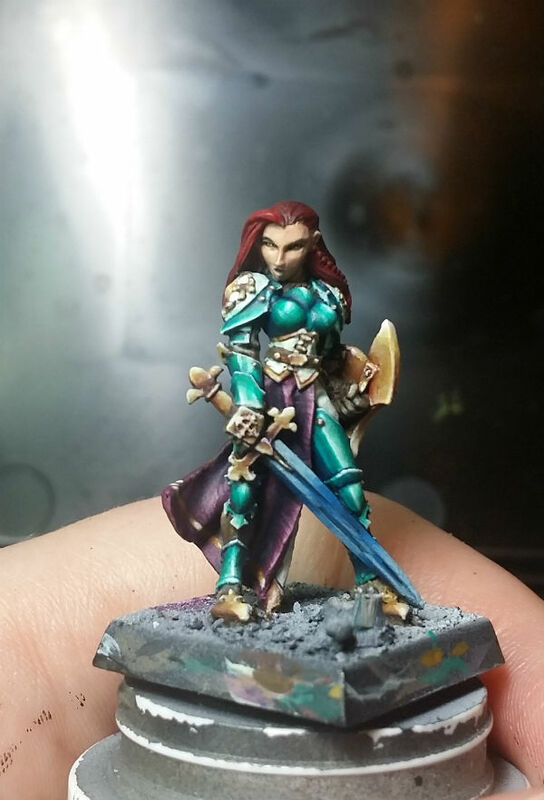 Next I will paint her skin/fur and face. I may also add more shadows to the dress as it’s lost a bit of the purple. 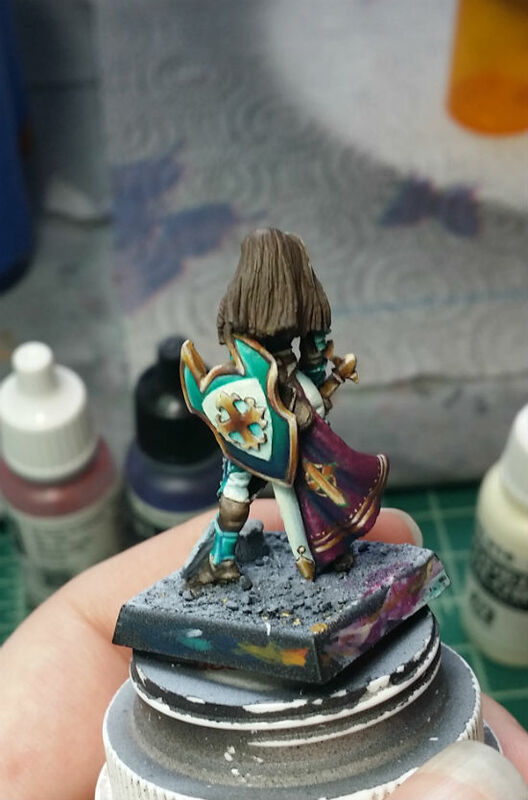 The shadows are VGA Hexed Lichen, which is becoming my go-to shadow color for a lot of things. The mid tone is VMC Dark Prusia Blue, and the highlight is VMC Sky Blue. A little bit of VMC Transparent Blue is involved, but only to help transitions between mid and shadow. 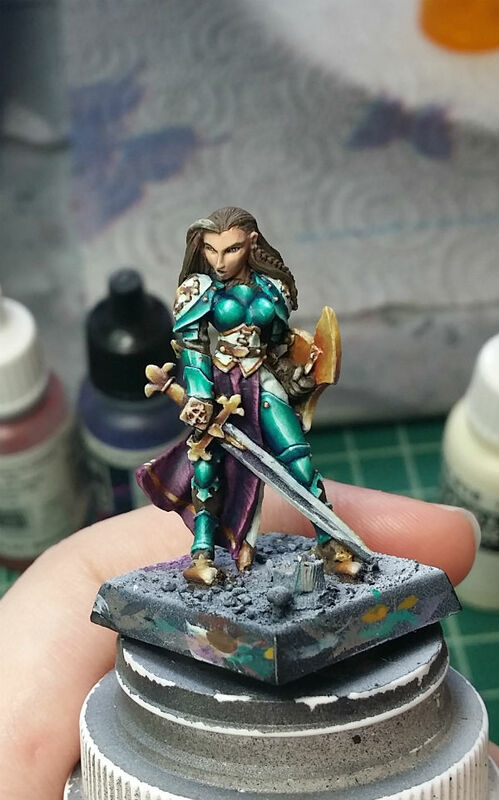 Transitions between highlight and midtone were done by painting a solid stripe of the highlight in the shape and approximate size I wanted, and then glazing the transition with thin Dark Prusia Blue.